As we approach Easter, Christians often view Jesus as a victim. Yes, the trial and crucifixion of Jesus were tragic because Jesus was not recognized as the Son of God. Yes, Jesus was the target of persecution; yes, he suffered horrifically. But consider that he was not helpless, not defenseless, not even afraid. How could that be? Dallas Willard used to say that Jesus was in charge of the entire arrest and crucifixion. He could have called it off at any moment. We know this is true because Jesus told Peter not to resist, saying, “Don’t you realize that I could ask my Father for thousands of angels to protect us, and he would send them instantly?” (Matt 26:53, For a different view of Jesus’s struggle in the garden of Gethsemane, see Life without Lack, pp. 84-85). We naturally view Jesus as a victim because if we had been in this situation, we would have seen ourselves as a victim. But Jesus was living in the Kingdom of God while I am only learning to do so. Recently I was teaching at Mater Dolorosa Retreat Center and spent time at the Stations of the Cross there. I stood in front of the station pictured here of Jesus being nailed to the cross and found myself thinking that if any of us were Jesus this would have been the worst moment of our lives. 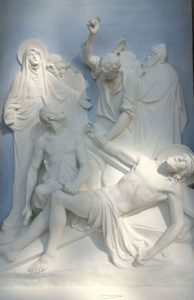 But the sculptor got it right in this and other stations in having Jesus looking above to the Father, no matter what. He was living in the strong, unshakable Kingdom of God, living a life without a bit of lack. Jesus could be fearless because he understood his relationship to his Father. Jesus is the first person who ever fully lived Psalm 23:1—“The Lord is my shepherd, I shall not want.” His union with his Father was such that he never knew lack or fear.” (Life without Lack p. 33-34) May you think about these ideas and ask God to show you more. 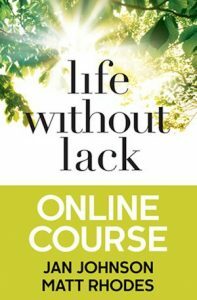 TO EXPLORE HOW WE LIVE A LIFE WITHOUT FEAR OR WORRY, join our online course based on the new book Life without Lack, based on my favorite set of tapes of Dallas Willard speaking.